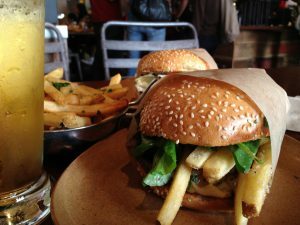 If you think $15 is too much money for a burger, wait till you see the price tags that come with eating some of the most expensive burgers in the world! Juicy’s Foods in Corvallis, Oregon boasts of having the most expensive (and the biggest) burger you can buy commercially in 2018. 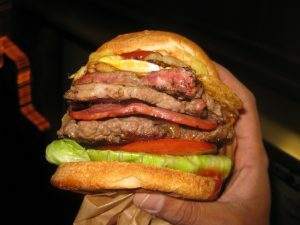 It contains around 350 kg of meat and toppings. However, there is not a lot of information on what this burger actually consists of in detail because it is only made per request for special occasions. If you happen to find yourself in Las Vegas, Nevada and have $5k to spare, drop by Fleur in Mandalay Bay and order this beauty. This French restaurant is owned by world-renowned Chef Hubert Keller, a Frenchman himself. The catch is that the burger itself costs about $70, but it comes paired with a bottle of Bordeaux, a 1995 Chateau Petrus, which alone can go for around $5000 (it is served in Ichendorf glasses that you can take as a souvenir upon finishing your meal). The patty comes in a freshly baked brioche bun. It is made from prime foie gras and Wagyu beef, and it is topped with black truffles and truffle sauce. London’s Honky Tonk is a restaurant where you can find this burger covered in gold leaves. Yes, you can actually eat gold and why not try it with one of the most expensive patties in the world. The restaurant states that this burger has 14 ingredients (including mayo and salt). The patty is a mix of New Zealand venison (60g) and Kobe wagyu beef (220g), seasoned with none other than the Himalayan salt and comes with Canadian lobster covered in Iranian saffron – very international! You will also find a black truffle Brie at the center of the burger. The topping consists of bacon in maple syrup, a duck egg in a leaf of gold and beluga caviar. You are wondering if the bun can match all that – indeed! It is seasoned with matcha and mayo, and coated in gold leaves, as well. And there is also garnish – grated white truffle and champagne and mango jus. Le Burger Brasserie at Paris Las Vegas is the place to visit if you feel like splurging on some hamburgers and champagne (just like at Fleur, this burger comes with an obligatory bottle of Dom Perignon which pushes up the price). In a typical surf-and-turf manner, this burger combines seafood and red meat – the patty is made from Kobe beef and Maine lobster, and it is topped with French Brie, crispy prosciutto, caramelized sweet onions and balsamic vinegar which is one hundred years old. There is a choice of buns: you can either choose an oven-dried tomato ciabatta (which they bake twice a day, so it is always fresh), or a caramelized onion bun covered with sesame seeds.